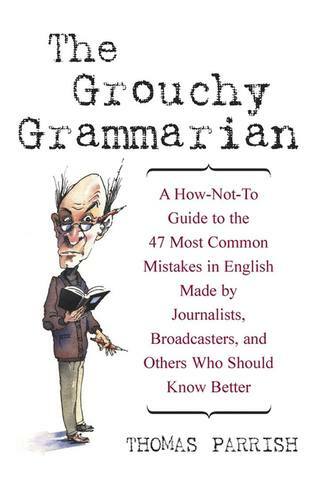 The Grouchy Grammarian: A How-Not-To Guide to the 47 Most Common Mistakes by Journalists, Broadcasters, and Others Who Should Know Better / Ворчливый грамматист: «Как-не-надо» руководство по 47 самым распространённым ошибкам журналистов, дикторов и других, кто должен знать лучше Год выпуска: 2002 Автор: Parrish Th. / Пэрриш Т. Издатель: John Wiley & Sons (24 Sept. 2002) Язык курса: Английский ISBN: 978-0471223832 Формат: PDF Качество: Издательский макет или текст (eBook) Кол-во страниц: 194 Описание: "Ворчливый грамматист: «Как-не-надо» руководство по 47 самым распространённым ошибкам журналистов, дикторов и других, кто должен знать лучше" Томаса Пэрриша (издание на английском языке). Do you commit apostrophe atrocities? Are you tormented by the lie/lay conundrum? Do you find yourself stuck between floaters and danglers? Do your subjects and your verbs refuse to agree? If so, you're not alone. Some of the most prominent professionals in TV broadcasting and at major newspapers and magazines-people who really should know better-are guilty of making all-too-common grammatical errors. In this delightfully amusing, clever guide, Thomas Parrish points out real-life grammar gaffes from top-notch publications such as the New York Times and the New Yorker to illustrate just how widespread these errors are. With red pen in hand, Parrish's fictional friend the Grouchy Grammarian leads the charge, examining the forty-seven most common mistakes in English and imparting the basics of good grammar with a charming mixture of fussiness and common sense. All of which makes The Grouchy Grammarian the most entertaining, accessible how-not-to guide you'll ever read. Скриншоты.